Color is always doing something. Sometimes color screams out a message, sometimes it casts a subliminal spell. So, what's happening in the world of color today? Yesterday? Tomorrow? What are the facts, what are the myths? "Color trends for 2018" is a challenging topic because there are trends that emerge from mass culture - and are frequently fed by media - and there are the "Color of the Year” proclamations that arise from the big business of trend forecasting. In the first case, there’s no time limit; in the latter, it’s specific to the year. Above all else, trends get us to look at color in a new way. The article states: "Are you quick-tempered? Have bouts of aggression? The reason could be lack of pink in your environment! 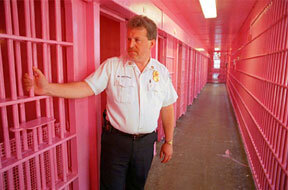 According to psychologist Daniela Spath a certain shade of pink calms the nerves, including in aggressive prisoners." 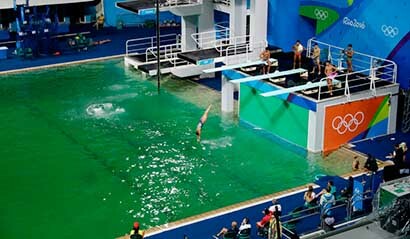 The Olympic swimming pool in Rio turned green last week. In spite of assurances that it was safe, athletes were appalled and observers describe it as swampy and sewerish. This is a lesson for all color enthusiasts: The context matters as much as the symbolism of a color. Green means go in a traffic signal and good luck on a shamrock, but green racing cars can be unlucky, and a green swimming pool might just make you think that Kermit the Frog peed in the pool. In Russia, a colloquial expression for an insane asylum is "yellow house" because (a long time ago) they used to be painted yellow. "The Yellow Wallpaper" by Charlotte Gilman Perkins has been tied to a certain form of OCD. Furthermore, the color of the wallpaper has been explored in a number of scholarly literary papers. Van Gogh's palette became more and more yellow towards the end of his life. His "insanity" was supposedly caused by lead poisoning because he inadvertently "ate" his paints ("hand to mouth" gestures, holding a brush handle in his mouth, etc.). Studies on the effects of LSD (& other hallucinogenic drugs) have shown drawings/paintings by "crazy" folks with much more yellow as the effects advanced. The power of the color of shoes made the news recently – and it left a historic mark on women's fashion and athletic gear.